One of many bright lights emanating from Leeds at the moment are Just Handshakes, formally Just Handshakes (We’re British), who are about to release their highly anticipated debut album Say It. From the first few bars of the vibrant and encapsulating “London Bound” it is clear that this album will live up to the promise and excitement surrounding it. 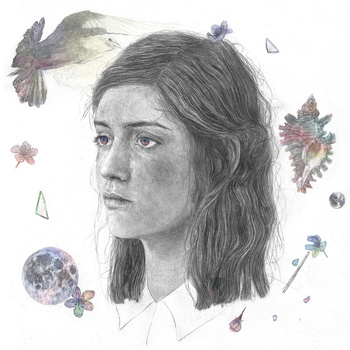 Clara Patrick’s vocals are haunting and beautiful with a childlike innocence to them. On first listen I was perplexed as to why they chose to begin with “London Bound” as it is clearly the highlight of the album and should be placed nearer the end so that the rest of the album builds towards it. After many further listens it became clear to me that whilst “London Bound” is instantly accessible and lovable the remaining tracks really grow on you, seeping into your consciousness making it difficult to select a highlight as they all gain equal footing. Patrick’s vocals have gained them notoriety but this album is a chance for them to show that behind the undeniably brilliant, ethereal, vocals are talented and creative musicians drawing on their skills and wide ranging influences. During “November” Clara’s voice is at its usual folksy best but it is the instrumentation which really drives the track. This is an incredibly strong debut album, it feels more like a collection of singles as there is certainly no hint of any of the tracks just being album fillers. This is also an album with has been carefully crafted around live performance rather than studio production, as each track leaves you eager to hear it performed live. “Kiwi”, “Dead And Alive” and “Shadows” build perfectly and have a really uplifting effect on your mood. Say It is released on May 20th through Californian label Bleeding Gold Records.